Eliminating the need to get 60 to get to the floor doesn’t change at all the (de facto) requirement that a bill needs 60 to pass. And so the majority isn’t going to bring a bill to the floor unless it has that 60, regardless of whether the motion to proceed is a hurdle or not. What I should have added is that the fight over the motion to proceed therefore has some positive value; it produces useful information for the Majority Leader and the bill managers. I think these are reasonable points. 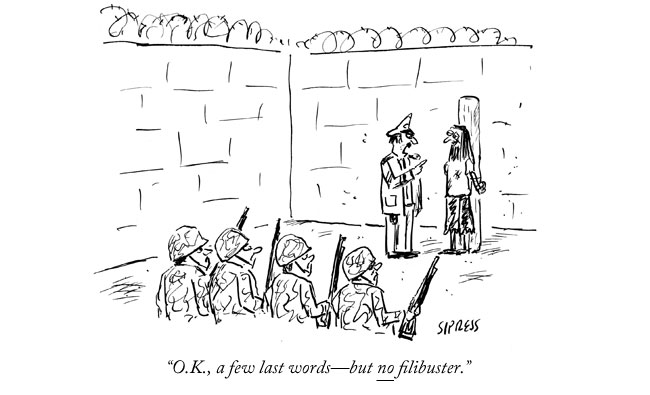 Still, I wonder whether banning motions to proceed filibusters might be worth more than it seems to the majority. Putting aside the possibility that Reid and the reformers might not be able to muster a majority for a tougher set of changes to Rule 22, I think it’s worth putting into perspective the use of cloture on these procedural motions and the value of such cloture motions to the minority. First, as majority leaders back to George Mitchell in the late 1980s have noticed, Senate minorities have become increasingly aggressive in their willingness to block consent on motions to proceed. 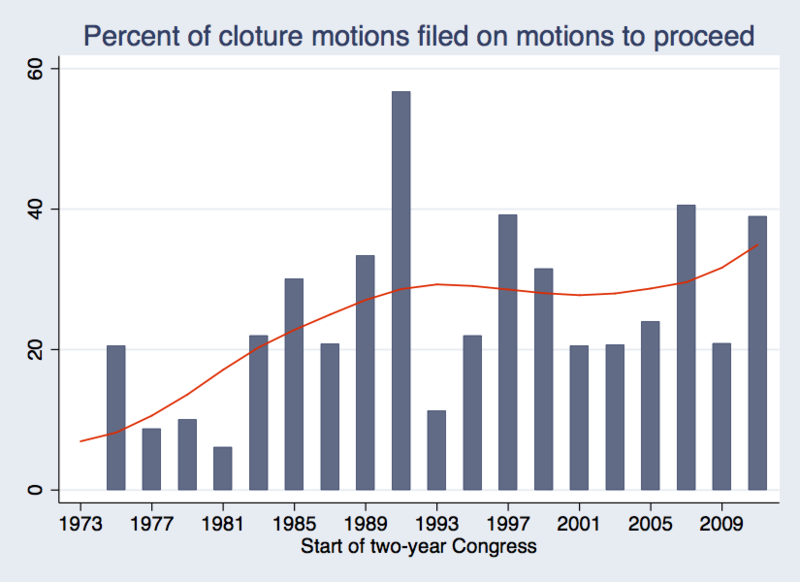 Although there is a good amount of variation in the number of times majority leaders filed for cloture on motions to proceed, the trend line has clearly risen over recent decades. Once we control (below) for the overall number of cloture motions filed each Congress, the upward trend is less pronounced but still evident. 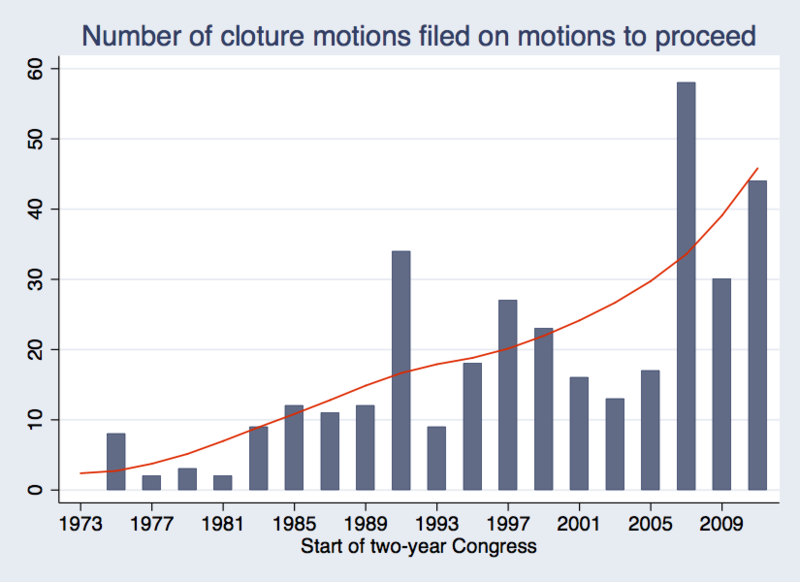 Moreover, some forty percent of cloture motions in recent Congresses have been targeted on motions to proceed. Given the amount of time consumed by the cloture process, eliminating these cloture votes might actually improve the majority leader’s ability to press forward with the majority’s agenda. It’s also worth noting that in recent years, majority leaders have had a mixed record in getting sixty votes on these motions. Cloture of late is invoked roughly fifty percent of the time, generally in line with cloture success on other Senate business. (Keep in mind that the denominator in each congress is the number of votes on cloture, not the number of cloture motions filed.) The sixty vote threshold is at least as tough and time consuming a barrier for putting bills on the floor as it is for getting to votes on measures and nominations. And for both, there is arguably value to the majority in trying to blame the minority for blocking action regardless of the procedural target of the cloture motion. Second, I think it’s worth stepping back to consider the value of the motion to proceed filibuster for the minority. Republicans argue that requiring sixty votes for the motion to proceed is a key source of leverage for pushing the majority to agree to its demands for amendments when a bill gets to the floor. In other words, the price of cloture for the majority is often guaranteeing the minority the right to offer amendments or even to secure changes to a bill before it comes to the floor. Think about Dodd-Frank in 2010. Most Senate Republicans had no intention of voting for the bill. But they exploited Reid’s need for sixty votes on the motion to proceed to force Democrats to water down several provisions of the bill before granting the majority the sixty votes needed for cloture to proceed. Eliminating cloture on the motion to proceed potentially undermines a helpful source of leverage for the minority—even if the minority can still make life miserable later for the majority leader during floor consideration of a bill. To be sure, it’s not always easy to anticipate the consequences of Senate rule changes. And as Steve Smith’s Senate Syndrome argument suggests, if the majority succeeds in shutting off motion to proceed filibusters, we would expect the minority to find other ways to continue to frustrate the majority. Reid for sure anticipates those reactions, but he may think that the benefits outweigh the costs at this juncture. Sarah Binder is a professor of political science at George Washington University and a senior fellow at the Brookings Institution.